LG Optimus Zone 3 is an entry-level smartphone from LG Electronics. It's the more advanced version of the LG Optimus Zone 2. It ships running Android 5.1 Lollipop and has a 4.5-inch display, 1.5GB of RAM, 8GB internal memory and 1.1GHz quad-core processor. 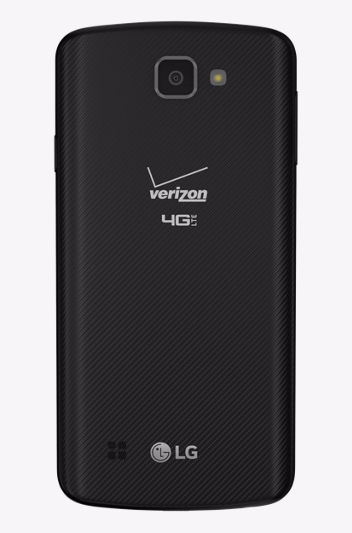 The LG Optimus Zone 3 works with Verizon Wireless with no annual contracts and flexible monthly contracts. LG Optimus Zone 3 is available for ordering from the Verizon Wireless website. The packaging includes the smartphone, battery, pre-installed SIM, travel adapter, standard USB data cable, activation card and a quick setup guide. The exterior design of the LG Optimus Zone 3 is quite typical of a budget smartphone. One noticeable difference is that LG did not place buttons on the back cover as they usually do with their other phones. It does have a camera and the hands-free speaker on the back cover though. The back cover is also removable, which gives you access to the battery compartment and the slots for microSD and SIM cards. The buttons fall on the frame of the phone; the volume rockers on the left while the lock/power button on the right. The top of the phone only has the noise cancellation mic, while the bottom edge has the headset jack, USB/charging port, and your microphone. The front panel is a 4.5-inch display. The top of the screen has the earpiece, proximity sensor and the lens for the front camera. There are no physical navigation keys; rather you will notice the floating navigation keys on the bottom of the display. The lens on the LG Optimus Zone 3 includes a 2MP front camera and a 5MP back camera. For the price of the phone, I found the cameras to be very decent. The back camera has a LED flash ensuring you don't miss to capture your beautiful moments, even in low light settings. Even with the limited pixels on the front camera, having one on a budget smartphone is a nice thing. You can capture photos by use of gestures and voice which is a luxury feature found mostly in mid-entry phones. The camera can shoot 720p videos at 30fps. The camera app includes the default mode and the manual mode. In default mode, the camera automatically evaluates the surrounding and captures a photo. The manual mode allows the user to adjust settings to their liking; i.e. change the ISO value, white balance and more. The LG Optimus Zone 3 boasts one impressive screen you can get on a mid-entry gadget. It has a 4.5-inch FWVGA display with a resolution of 480 x 854 pixels. Pictures and videos come out with vivid color and outstanding clarity that you will love. A feature that runs across most LG phones is the double tap on-screen to wake. This feature is also very much available on the LG Optimus Zone 3. LG Optimus Zone 3 comes with a 1940mAh battery. With a talk time of up to 11 hours and a standby of up to 10 days, I found this phone to perform well on battery life. The screen being small and compact, there's no much eating into the battery life. This means the phone will give a full day of usage without worrying about charging. Furthermore, the phone features a removable battery which you can easily swap with another battery when it runs. The onboard storage on the LG Optimus Zone 3 is 8GB. While most phones in this price line come with even less internal storage, the 8GB on the Optimus Zone 3 is a great selling point. Interestingly, the phone also supports memory expansion with an external microSD of up to 32GB. The LG Optimus Zone 3 is an averagely performing smartphone. It ships with all the necessary resources to ensure you achieve all your daily tasks. It comes running Android 5.1 Lollipop which supports over a million apps on Google Play Store. The LG UI runs on top of the Android operating system bringing in unique interfaces, icons and notification panel. The LG Optimus Zone 3 is powered by a quad-core 1.1GHz Qualcomm Snapdragon processor combined with 1.5GB of RAM. While this is not the largest runtime memory out there, the phone can still handle major applications fairly well. Multitasking is very much possible with the quad-core processor onboard. You will also experience smooth animations and nice user experience provided by the Android 5.1 Lollipop as you navigate through application screens. The phone has 4G LTE connectivity, which I find to be a nice thing on an entry-level gadget. With this, I was able to experience fast Internet speeds, and even video streaming on the Verizon LTE was great. Similarly, Wi-Fi is available, so you can connect to hotspots and enjoy free internet. Bluetooth is also supported for quick sharing of small files between your LG Optimus Zone 3 and other nearby devices. Camera: 5MP back, 2MP front. Battery: 1940mAh, removable. Talk time up to 11 hours. Standby time up to 10 days. Internal Storage 8GB. Supports memory expansion with an external microSD card up to 32GB. Processor: 1.1GHz Quad-core (Qualcomm Snapdragon). Dimensions: 5.19" (H) x 2.62" (W) x 0.35" (D). Sensors: Proximity, ambient light, accelerometer.